It is rare that I have the opportunity to blog about a once-in-a-lifetime opportunity. Literally. This morning though, for a couple hours anyway, I experienced a piece of film I thought I would never see on the big screen in my entire life and the experience had personal ramifications for me. 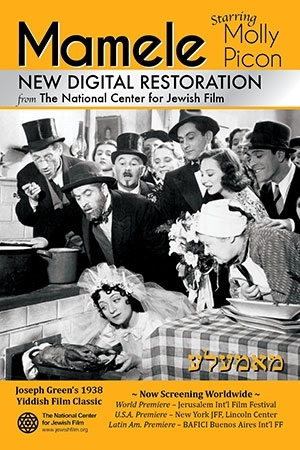 The 80th Anniversary showing of Mamele by the Jewish Film Festival of Atlanta, shared with its audience an obscure Yiddish film from 1938 that has the distinction of being the last Yiddish movie produced in Poland before the start of WW2. 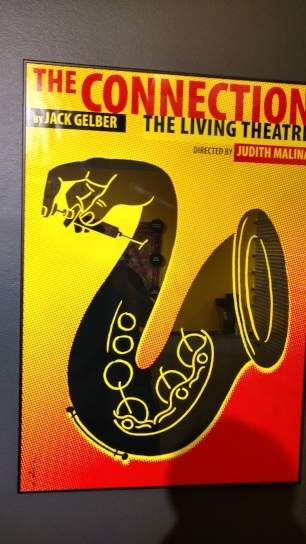 The production starred famous American Jewish actress/singer, Molly Picon, and was directed by Joseph Green and Konrad Tom. The movie has special significance for me because I use the production of the movie in a script I just finished. Little did I realize that two weeks after finishing the draft of the script, I would have a chance to see the film on a big screen. The film was restored in 2013 and for all I know, this is the first time its been shown in Atlanta since then. I wasn't kidding about that once-in-a-lifetime thing. Now, I admit, I figured that a 1938 Yiddish film no one had heard of, with an 11 a.m. Sunday morning showing, was probably going to sell only half-dozen tickets to die-hard film buffs. Man, was I wrong! 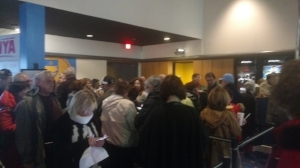 Forty minutes before screening and the line of ticket holders wound around the cinema lobby. That the film was practically sold-out brought unexpected cheer to me because in a way, I knew people in my script were being honored at that moment, even if the audience didn't realize what befell the cast and people behind the scenes who were involved with this movie. The movie itself - which I had never seen before - proved a gem. What you saw was a glimpse of life before the war. Green had a tendency to try and film in real locales and to use locals as extras. He was based in Warsaw, (though this story takes place in Lodz), and they would trot all over Poland to capture the feel of the script. The effort here was successful and with the city overview at the opening, I realized I was witnessing places and culture that a year later would be totally destroyed. There is a real Chaplin feel to this movie and Picon used her Vaudeville chops to the hilt as she played a younger daughter who runs her family of six after her mother dies. The rest of the family gives her little thought and treats her more as a servant until she falls in love with a neighborhood boy and leaves. Along the way, part of the family is tricked by a mobster and other relationships go stale. Humor keeps the drama light and moving, including one bit where Picon uses a fallen off door knob to pretend she has a gun to get the mobster to write a confession. It had the audience laughing. Picon was known for her voice as much as her acting. This really isn't a musical but there are about half-dozen songs scattered through the movie, including a rather beautiful duet with the co-star her character falls in love with along the way. The music also leads to one of the most brilliant pieces I have seen in a while. Somewhere along the two-thirds mark, Picon is looking at a photo album when she breaks into a song. But Green uses the opportunity to zoom in on the pictures (of Picon being her mother) and at different ages she sings about the passing of life and dancing. At eight she was dancing with her feet. At 21 with her hips. At forty-something with her hands and in her eighties with her mind. I could feel the audience around me being emotionally moved by this poignant rendition. The ingenuity and timing of that scene stood out from the rest of the film. It was brilliant for its time and would have shone in a movie shot yesterday. I had few complaints about this movie-going experience. Characters in my script, that I had hoped to see, weren't in this restored edition. I do know there are short outtakes in Warsaw that can be seen at tourist sites there. That hope of capturing them while they were alive in the background somewhere was a long-shot from the start. It would have been nice if the Jewish Film Festival had given more details about the film when presenting it. The lady doing the introduction was fine - don't misunderstand me - but I would've liked to known more about the film itself, like how it was saved or restored, maybe which actors survived the war and who didn't. That TCM kind of trivia movie buffs like me eat up. There were no details shared and that was a shame. If you would like a glimpse into pre-war Poland, particularly Jewish life, this is the film to see. It is delightful and can be bought (I do believe) off Amazon. I give it a 5/5. This was definitely a highlight of my year. Stashed in the basement of the Iraqi Intelligence Headquarters were thousands of ancient Jewish documents. Why Saddam's Intelligence officers were collecting ancient artifacts of a people who had long fled Iraq remains a mystery. But in the days after the fall of Baghdad to U.S. forces, they were discovered there. A tip led a team to the building. They discovered a flooded basement and thousands of pages of documents, ranging from the 16th century to the 20th century, floating in the water. No one is even sure how the basement flooded. Possibly a bomb burst open a water main. Possibly officers turn on all the faucets on their way out the door. In an unusual move, a team from the National Archives was sent over to help rescue the documents which are now on display at The Breman Museum in Atlanta. This past Sunday, members of the Institute got a V.I.P. tour of the exhibition which is running through April 29th, 2018. The curator of the exhibition was on hand - and if I recall right, his name was Gabe - to give us a very detailed, enthusiastic tour of the pieces on display. Iraqi (Babylonian) Jewish community is essential to modern Jewish culture. 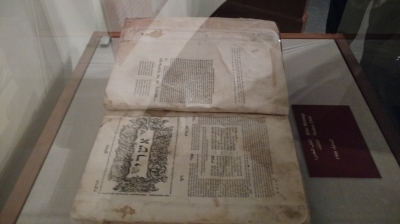 Most Talmudic interpretations have roots there and a page of an ancient Talmud was on display. 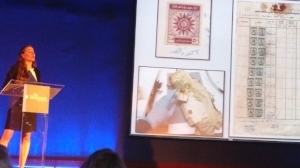 After the guided tour, there was a presentation by Anna Fridley, a member of the conservation team at the national archives. She has Atlanta roots and many in the audience were familiar with her family. She did an excellent job of describing how the documents were saved. She didn't get too technical (though she answered my technical question during the Q & A) and it was easy for the lay people in the audience to grasp how a conservation team works. In the case of these 3000 plus documents, mold was a major issued due to the water exposure in the basement of that Intelligence Building. She went through the steps they took to salvage the pages and photographs. Later everything was digitalized and is now available online. When Jews left Iraq, they left with nothing. These documents and photos are now being used to reconstruct family ties and history by the Jewish community after it was transplanted. I was surprised to learn that at the start of the 20th century, 1 in every 4 residents of Baghdad was Jewish. During the 1950's, almost 2/3rds opted to be airlifted out due to persecution. You can now probably count the number of Jews left in Iraq on your fingers. There are rumours of a Jew here, one there, but for the most part, the Jewish presence in Iraq is now a thing of history. There was Middle East food for the guests. Dolce Catering served up a delightful sampling the regional cuisine and I would recommend them for any event. Also on hand were a trio of musicians, led by James Schneider, to keep the regional vibe going. You can check a clip of them out in my last post. 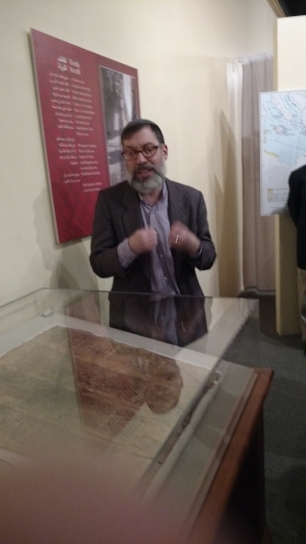 This is a rare chance to glimpse what is not only a piece of Jewish history but of world history. Stop by The Breman Museum today and tour the exhibit. On the rating scale, it gets 5/5. You can also check them out online HERE where the collection is posted for anyone to see. Always more fun in person though. These guys were playing at The Breman Institute Members Only event Sunday. I will blog about that tomorrow. There is a Grammy-nominated writer in this mix. Enjoy some simple Oud. I haven't posted in 2018 until now because the year has started at a frantic pace. It is all I can do to keep up. 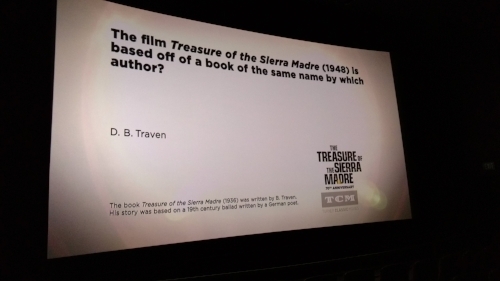 However, tonight, I took three hours to myself to go see TCM's presentation on the big screen of The Treasure of The Sierra Madre. Seeing this movie turned into an adventure in its own right. A snow/ice storm came in on my way there. In Georgia people treat the forecast of half-inch of snow like it was a Noreaster. Consequently, when I arrived, only about a dozen people were in the 20+ cinema complex. I was informed that the concession had closed before the 7 p.m showing. The lone guy in the ticket window wasn't going to let me sneak a soda in but I made him ask the manager who consented to this one time exception. How nice, I guess. This is what it looked like in my theatre. Basically, I had a private showing. One other person joined me just as it started. Still, I had to get someone to turn down the lights as they forgot to do so. But once they did, it was awesome to see this movie. John Huston is one of my all-time screenwriters/directors. And he won 2 Oscars, for both those categories with this film. He also directed his father, Walter Huston in this production. Walter Huston won an Oscar for Best Supporting Actor. And it was deserved. Besides, the two Huston's, Humphrey Bogart has a lead in which he portrays Fred C. Dobbs, a down on his luck worker, turned prospector, who eventually lets paranoia get the best of him, leading to his own demise. It is an evil Bogart in the end that will surprise many fans and ranks as one of his best performances. Tim Holt plays the third prospector in this tale of greed run amok. Unlike Dobbs, he finds a redeeming quality inside himself and barely escapes with his life. There are also cameo's by John Huston and a young boy named Robert Blake. Yes, that Robert Blake. The story is based on the book by B. Traven, who I want to read more about. TCM spoke a little about him after the movie. They said he used several pen names, and guarded his true identity so much that he used an alias to work with Huston on the film. He showed up, introduced as Traven's assistant. And though the crew caught on eventually, it wasn't until years later that Traven's wife admitted it had been Traven all along on the set. This was a great Tuesday escape for me. Seeing this movie on the big screen was a rare chance to enjoy the classic in its original format. For those of you who haven't seen it, well, the DVD is out there or you can rent it and stream it at home. I recommend you do so. 5/5 on the rating scale. Every year at this time, I blog about my favorite Christmas show and a funny experience I had surrounding it. Last year, for some reason - maybe because I changed hosting sites - I didn't blog about it but this year, I am renewing the tradition. It is worth the repeat if for no other reason than it still brings a smile to my face. One of the most highly rated shows to be prematurely cancelled because networks couldn't work outside a formula was My So-Called Life. It made Claire Danes and Jared Leto stars. There was a Christmas episode titled So-Called Angels that starred the singer Juliana Hatfield. The storyline concerned a main character who was tossed out of his home at Christmas time and the main character's quest to help him. Homelessness and runaways were a huge problem then - in fact the actor who was a regular had been homeless until he was cast on the show - and is even more so now. I started telling my friend about the So-Called Angels episode which had been repeated on television (this was before the Netflix era) the night before. Then the waitress (who we knew) stopped as she was passing by, and exclaimed, "Did you see that too? I wanted to cry!" And before I could really respond much, the table next to us went, "Are you talking about that 'My So-Called Life' show?" And then the table next to them went, "I saw that too! I just wanted to get up and help someone afterwards". And then a lady at another table started crying ... well, you get the picture. In less than five minutes, there was 100+ strangers in the same room talking about the same television episode. 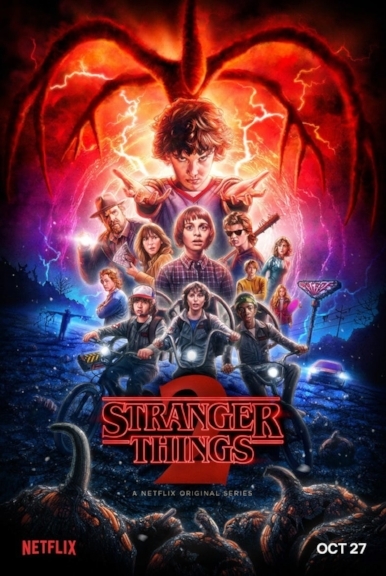 The ones who had seen it were reliving the experience all over again and motivated to tell the ones who hadn't watched it, all about how it moved them. I sat there with my friend, looking around, and finally chuckled at the chain reaction that had occurred. Looking at him, I said, "See! It was a good show." That experience has stuck in my memory ever since. And I watch that episode every Christmas. Sometimes I watch it twice. And yes, I've been known to cry before it was over. Juliana Hatfield wrote a special song, Make It Home, that became something of a fan favorite and I still play it every Christmas. In fact I put it on a CD one year that I made for employees at a church and they ended up loving it. But that is a side note. The Inner Voices harmonizing of Sleep In Heavenly Peace (Silent Night) is brief but a beautiful rendition. That is my story. I wish you the best of holidays. If you are with friends and family then enjoy the time. If you aren't, peace be with you all the same. And as a gift I post the two songs I just mentioned. Happy Holidays! My fav Christmas lights decoration of the season. We may have a fascist cloud hanging over the land but some angel a long time ago once promised us peace on earth. We have a BIG IOU to cash in. There was a Ghostbusters Xmas Sighting. I ran into this bunch at a local diner. They'd participated in a Christmas parade. They had the car (new movie version) out in the parking lot too. It was really kewl. I asked them if I had to worry about a giant Marshmallow Man tromping through my neighborhood. They assured me I was safe for the evening anyway. I wish the car above was mine. It pulled into the garage while I was there and quickly became the envy of everyone present. Oh, why was I at the garage? Look below. Some guy - who was having a terrible day all on his own - backed into me while I was parked. Fortunately, he was an honest man and tracked me down to tell me about it. Most drivers here just take off. Unlike the guy who hit me, his insurance company is trying its best to rip me off. They say the door can be replaced for $98. If you're laughing, I guarantee you that the mechanics were laughing even harder. Pretty sure I will blog about the insurance company when this is over. I have to argue with them next week. They gave me an estimate of 1/2 what they admitted it would cost for repairs. No one is surprised of course. Like most insurance companies, they're basically just a legal criminal enterprise. At the same time as the wreck, my Le Mans key chain broke! I guess it is giving me an excuse to go to Le Mans and buy another one. This one was a gift but I have always wanted to go to the Le Mans 24 hr race. Just think it would be kewl and I'm not even a racing fan. Well, I sign off on that note. Take the car out of the equation and it has actually be a really interesting month. More good than bad to be honest. Strange at times but positive. If life wasn't strange or interesting, I'd probably be worried. Filed under the category of things you don't ever expect to happen to you personally, comes this experience from last week. Basically, I got confronted by a guy passing himself off as a police officer when he wasn't. While standing behind the counter at my part-time job, this guy comes in and whips out a badge from under his shirt. It was on a chain just like the movies. He didn't give his name but only said they were looking for a particular person. I leaned in to take a look at the badge - mainly because I didn't have my glasses on - and realized he had his hand cupped over it so I couldn't read it. Then he whipped it right back under his shirt. Red Flag One. It also irritated me. He thrust a photo in front of me of the guy he was searching for in this manhunt. The photo was on a plain piece of paper, run off someone's home printer from a badly scanned pic. While he is going on about the guy - who I had never seen - but who he described as 5'1", long hair, and weighing 250 pounds (basically he was looking for an obese long-haired pygmy) - I was noticing his shirt. The shirt, resembling a garage mechanic's, was embroidered with USCA. I started thinking to myself, I know most of the security agencies, who the hell is USCA??? After confronting a couple other workers, and as I started to ask a pointed question, the guy avoided the manager and left as quickly as he came in. My first reaction was to say, that guy was no cop. After some back and forth, the others consented they didn't buy into him being law enforcement either. The fact he looked like he was in desperate need of a shower and had his shirt buttoned wrong, were also Red Flags. Still, no one at the store wanted to call the real cops. Mainly because at the store, like most people, no one enjoys interacting with real cops. You never know what you are getting into once you start down that road. But the incident kept bugging me and so I repeatedly brought it up over the next hour or two. Then the next shift came in and this high school girl who is always full of life and humor, says, "Yeah, we had this weirdo come in last night and flash a badge, saying he was an investigator." Turns out it was the same guy and he had tried to pump her for some personal information. Definitely a Red Flag! I looked at the manager and said, hey, if you don't want to make the call, I will. He relented and told me to call from the office. Consequently, I ended my shift making out a police report. To her credit, the female co-worker got a look at the vehicle he was driving. An old SUV. Apparently, he couldn't get his hands on one of those black SUV's they use in the movies. Guess the fake badge busted the budget. Fortunately, he hasn't been back and that bizarre incident has been filed under, "Huh, go figure..." Makes for a different kind of blog post though. She lost her sister in Auschwitz. Her boyfriend and future brother-in-law to a firing squad. All three for Resistance activities. She herself lived off forged papers before joining the French Army, going behind Nazi lines as a nurse and providing key military intel on troop movements that won her a couple dozen medals. When the war was over, she was in Occupied Germany and then left the army to be a nurse in Cambodia and Vietnam. This is the life of Marthe Cohn. 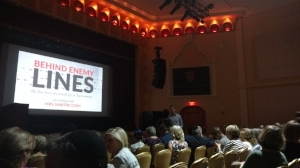 I went to hear her speak last night at the Buckhead Theatre. Cohn is 97 but a pretty lively speaker and it was easy to tell had a bit of wit about her. Sitting next to her was her husband who helped her along at times. The event was sold out and some schools must have made the night a project because there were a fair number of school-aged kids on hand. I sat next to a few. They were well-behaved and listened intently. A good sign for the future. Marthe has written a book about her exploits, Behind Enemy Lines. I found her discussion frank, without hyperbole so my guess is that the book is a good read. She was at her best when she was describing her sister - a hero in her own right - and the fate that befell her after she was arrested, put in a French camp, then eventually deported to Auschwitz. Clearly, this experience remains an open wound in her mind. 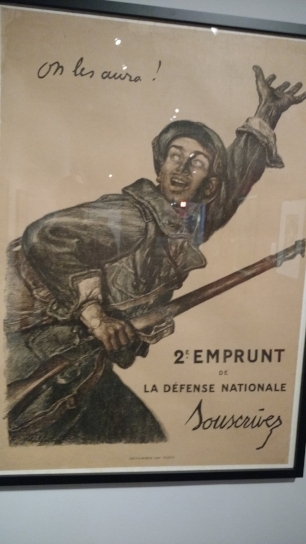 It was interesting to hear first hand the exploits of a spy and also the situation the French Army found itself in toward the end of the war. From her talk, I also learned how vast the French resistance to the German occupation was and how the population circumvented German rule to keep Jews and others alive. The only downside to the night was the Buckhead Theatre itself or the organizers. I can't say which. There were technical difficulties with the curtains not working right. Also a DVD was played at the very beginning and it had a severe buffering problem which someone should've known about before the presentation. But the audience bore with it. 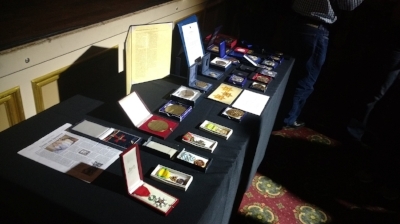 You can see pictures of Marthe Cohn in this post - she is very short - and the medals she won which were on display (although the Theatre never turned up the lights afterwards to get a good shot). Overall, it was an interesting story to hear and a fine way to spend a Thursday evening. 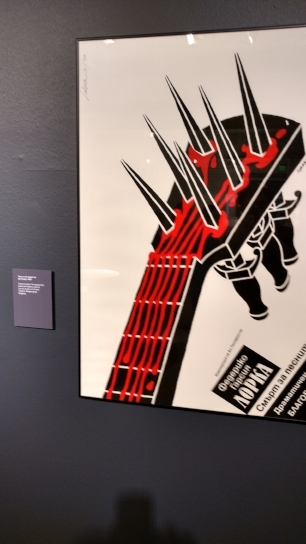 This month I went to see an exhibit at the MODA in Atlanta of world-renown Luba Lukova's work. I have posted a sampling from the exhibit, snapped with my trusty phone so don't expect Pulitzer photos here. But this gives you an example of her work. I like her art because it is simple, challenges the mind, and uses little text to get the point across. There is very much a propaganda feel to her style. I don't know if as a Bulgarian, a Soviet influence crept into her style or not, and I don't meant that in a bad way. Hey, they knew how to make propaganda work. I really like the first poster that I put up here. There are other good ones not shown and it is worth the visit. MODA is less than ten bucks for a ticket and the tour is one floor so can swiftly done on your lunch break if need be. I encourage you to check it out if you get the chance. Believe it or not, this year marks the 100th anniversary of the U.S.A. entering WWI. There is an exhibit at the Atlanta History Center, I believe simply titled Uncle Sam Wants You! 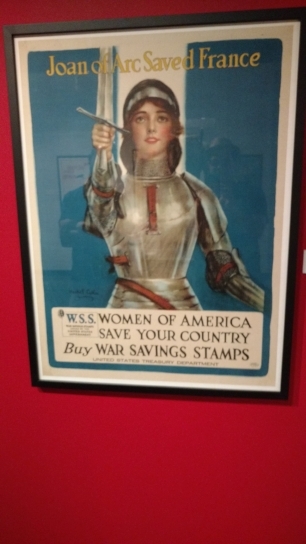 that features posters, propaganda pieces, and artifacts from WWI. Here is just a handful of snapshots that I took while touring it. I encourage you to check out the exhibit if you get the chance. Tucked behind the main museum of the Atlanta History Center, a short walk's distance down a path, is President Snow's Mansion. President Snow as in President Snow from The Hunger Games. In real life the place is called The Swan House. 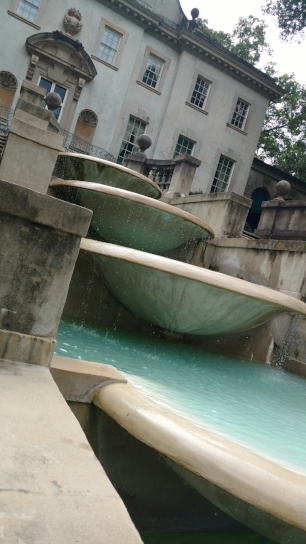 My friend and I were on a tight schedule so we didn't have time to tour inside but we took a couple quick shots outside. You can see the mansion and the field where the party scene was filmed. A sidebar. There was a photographer setting up for a wedding. He was using a drone to stream the event. It got me wondering what sorta omen it was to have your your marriage attached to The Hunger Games. The Breman Institute's Summer Course Teaching The Holocaust has come to an end. It was amazing. If you have the opportunity to spend a week in this course, I highly recommend it. The staff was top-notch, experts in their field, friendly to the umpteenth degree. The time is valuable and every moment is crammed with learning and activities. Even lunch is spent with survivors and conversations about the material. Most importantly for me was the ability to interact and ask questions. Open discussions were encouraged and so when you are able to ask survivors or people at the Yad Vashem questions directly, your horizons are broadened. The above picture is our final class picture. The elderly man in the middle is Hershel Greenblat who as a kid spent his first years living in a cave in Ukraine. Then he went to a displaced persons camp for five years before ending up in the States. His parents aided the partisans, his mother being wounded in a firefight, but managed to also come stateside where they settled in the poorest section of Atlanta and started a small grocery that soon prospered. One detail I found interesting about Mr Greenblat was the role his father played in Atlanta. The Holocaust experience transformed the family into becoming missionaries for equality. Hate kills and the best way to avoid future genocides is to eradicate hate. The Greenblat store was a hub in the black community and soon Mr. Greenblat was close friends with M.L.K. Listening to Mr. Greenblat speak of this special relationship was very moving. Earlier in the week there was another survivor from France. Her name was Manuela Bornstein. She and her sister are in the States thanks to a little village called Le Got which openly hid her family from the Nazis during WWII. The tale of leaving Paris for Vichy France, illegally boarding trains, sneaking across borders in the dead of night, hiding in a house with Resistance Fighters, is quite the tale. Her sister wrote a book about their experiences which can be had through the Breman Museum Gift shop. One thing I should add. These survivors - like all survivors - are in their 80's or 90's. But I know tons of 30 and 40 year olds who aren't half as spry as these people. I felt fortunate to be able to listen to their experiences while the opportunity afforded itself. If you the chance to see one of these people - or any survivor - presents itself, by all means grab it. Students bringing copies of Mein Kampf to school for their classmates to sign like it was a yearbook. White Supremacists trying to recruit. Chants of "build the wall" that torment Latino students. This is just a smattering of what Erin Beacham is dealing with in our current political climate. As the Regional Director of the ADL (Anti-Defamation League) she works directly with teachers and school districts. She is the Regional Education Project Director which means she is working directly with schools and teachers including all the schools in the Atlanta School District which are signed up to its No Place For Hate educational program. Hate is the core element that makes genocide possible in the first place. Without it, there is genocide. Consequently, hate came up as a theme several times this week. Combating hate is what these teachers who were in the seminar are all about. Erin Beacham encouraged the teachers at the Breman Institute to get their students to sign pledges and show them how they can change behavior even at an early age. Prejudice is often learned in the home and she relayed how students in the program had gone home, heard a racial remark, and interceded with their parents. The ADL has a program that is adaptable for any age. One hand it is sad that programs need to exist at all but encouraging that steps are being taken to head off what may be a repeat of history. This post is about three B's that are central to my week. I'm talking about the The Breman Jewish Museum, Brendan Murphy and Ben Walker. See, I'm enrolled in a week-long intensive course designed to help train educators to teach the Holocaust. The course is a specialized annual program offered by The Breman Institute in Atlanta. I have to say, it is only day two but I've gotten a lot out of the course and am very glad I enrolled. Due to time, I probably won't blog about the course everyday but I hope to do at least a couple posts this week. We are in class from 8:15 to 3:15 each day and it is non-stop with only a small lunch break. Each day we spend time connected to the Yad Vashem in Jerusalem and also have a featured Holocaust Survivor who speaks to us and takes questions. Those two elements alone make the course a win for me but they aren't all that is happening but that is where I will start. Today's Holocaust survivor was Ben Walker (pictured above). He is in his early 80's and was originally from rural Romania. He managed to survive the war with his mother but lost his father and sister. However, like many survivors, he avoided discussing his experiences for decades. What changed his mindset about speaking out was 9/11 and the fear he saw in his daughter and kids after that event. For the last 16 years he's been the voice of a witness, sharing his personal journey through the tragedy that at the time destroyed his world. What I noticed about Ben is a trait many survivors exhibit: a healthy sense of humor. He joked and asked face-to-face questions of his audience. In doing so, he shared the source of his strength - a renewed hope that had been rekindled somewhere down the line. Ben focused on the Ukraine and Romania which are little discussed and his eventually aliyah to Israel where he lived on a kibbutz with other survivors. Apparently, in the desert hope does bloom. I highly encourage listening to Ben if you get the chance. Well, that brings me to the third B. Dr. Brendan Murphy spoke for nearly three hours on antisemitism and the roots of this demented ideology which he traced back to the time of Jesus and then walked his class through the timeline of events since. We spent a good deal of time (but the time flew by) in the Middle Ages talking about how the Catholic Church and especially Martin Luther incorporated antisemitism into their teachings. Martin Luther in particularly wrote what amounted to a foreshadowing of a Nazi Manifesto. It was disturbing to see religion twisted for the sake of prejudice and realize how often it goes unchecked from behind the pulpit. Still, the hatred of Jews doesn't explain how mankind makes the leap to genocide which became a staple of the 20th century. Brendan Murphy fielded a theory that the ingredient that made genocide possible was racism. He explored the aspects of that and it was a thought-provoking session. There is a lot to absorb. I am looking forward to tomorrow's Yad Vashem hookup as it is suppose to be about ghettos. I have like five questions already to ask so I will have to weed the list down tomorrow over morning coffee. I like a good challenge. This past Sunday, I had the absolute delight to attend a presentation by Dr. Eugen Schoenfeld. The 92 y.o. 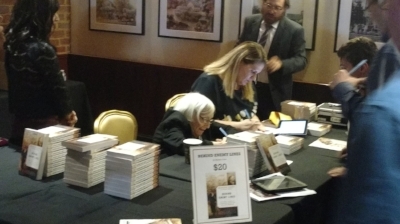 is an Auschwitz survivor, former Chair at Georgia State University, and gave a profound speech at The Breman Museum in Atlanta. He was part of the Museum's program of hosting survivors at free events for the public. It was a packed house, people of all ages, as we first watched a short documentary of Schoenfeld relaying his travails during the Holocaust before he took the podium to speak for nearly an hour that included Q & A.
Dr. Schoenfeld is not the first survivor I have met. That distinction rest with Lola, who like Dr. Schoenfeld had a wicked sense of humour. Writing that last sentence, my curiosity wonders if that is a survivor's trait? I suppose there is a big depends attached to that. I could write several pages on the presentation, how it moved me, and deep philosophies that he challenged his audience with - and I did appreciate the fact that he challenged his audience. He started by saying that it was time to move on from just observing The Holocaust to preventing the causes from existing that will create future ones. One thing the audience overwhelmingly shared with the speaker was the sense that we are seeing the rise of Fascism again and that no one sitting there that day was safe. I will stick to one point he made and one moving story he shared. He wrote a paper, years ago, on how tolerance has flaws. He asserted that instead of tolerance we need accommodation based on shared moral understanding. Tolerance infers a weakness, superiority by one party over the other and makes zero headway in the two parties reaching an understanding. In fact with tolerance, one party is typically at the mercy of the other. With accommodation, there is an acknowledgement of the individual differences and how two parties will work with each other along defined lines. He stressed that we are not solely individuals but rather interdependent and without accommodation to get us past wars, we will doom ourselves as a species. There was a story he relayed from his experiences during the Holocaust. He spoke of being liberated by an American unit. He spoke English so the survivors chose him to speak on their behalf. Turns out the officer in charge was Jewish which shocked Dr. Schoenfeld at the time. As former guards etc. were being marched out of the camp, Dr. Schoenfeld pointed out a Capo who had nearly killed him by beating him with a club. He told the American officer who the guy was and what he had done. The officer took out his sidearm, handed it to Schoenfeld and said, "Shoot him. Shoot him. Put a bullet in his head. No one will do anything to you if you kill him." Schoenfeld thought about it, then handed the pistol back. I wonder how many of us would've chosen that option. I could go on about this event. It was extremely thought provoking for me. Even at his age, Dr. Schoenfeld was gracious enough to sign books, take photos etc afterwards and I got to ask a couple questions which made the experience that much richer for me. By the way, the title of his book is, My Reconstructed Life and can be ordered from the Breman Museum Gift Shop. In the current climate, the lessons of the past loom large. We all should learn from them. Donald Trump, under fire for ignoring Jews and the Holocaust in the past, spoke for Holocaust Remembrance Day this week. He plagiarized his speech. Apparently, when you could care less about something, you copy the homework from someone else. Should we be surprised? Neo-Nazis and Holocaust deniers are easy to find in the halls of the West Wing. So, no, I am not surprised. How timely the DVD of Denial is then. I had a random evening to watch something and saw it in Redbox. The movie is based on the early 21st century trial that David Irving brought against professor and author, Deborah Lipstadt. Irving is a self-proclaimed historian and legally recognized Holocaust Denier and Lipstadt wrote the book, literally, on Holocaust denial. To set the stage for this movie, the real life events were that Irving sued Lipstadt in the U.K. He sued in the U.K. because that meant the burden of proof was on Lipstadt to prove that the Holocaust happened and that Irving, in his books, purposely twisted facts to fit his agenda. The movie is well cast with Rachel Weisz, Tom Wilkinson, Timothy Spall, Andrew Scott, and Caren Pistorius, all having major roles. This means some top-notch acting. And while it is a legal drama without a smoking gun, the action is surprisingly unexpected and intense. There were two script/final edit issues I could pick a bone about but I suspect most viewers won't even notice. This film is a stark reminder of what survivors, those struggling to remember, have to face in the lengths that deniers will go to when they viciously attempt to bury the facts to serve their own ambitions. I recommend this film and give it a 4 of 5 on the rating scale.